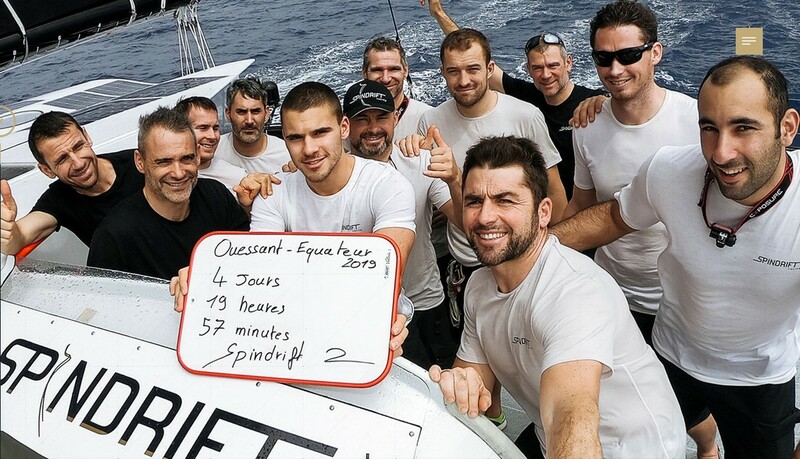 On Monday 21 January at 07h 45 UTC, Spindrift 2 crossed the Equator in 4 days 19 hours 57 minutes, breaking her own record by just over an hour. This also gave the team an advantage of more than 23 hours (180 miles) over the current holders of the Trophy Jules Verne, IDEC Sport. This is the first challenge in the team’s quest to beat the round the world record. The time for the passage from Ushant to the Equator still has to be officially ratified by the WSSRC (the international organisation that oversees records), but Yann Guichard and his crew can be pleased with this first section of the course, and bettering their own record time, set in 2015 (4d 21h 45′), by 1 hour and 48 minutes. Spindrift 2 crossed the start line in front of the Créac’h lighthouse on Wednesday 16 January at 11h 47 ’27’ UTC and quickly took advantage of the favourable conditions. However, the team is not out of the Doldrums yet, as they are currently stretching some 120 miles to the south of the Equator. They will have a challenging six hours or so before they can hook into the south easterly trade winds blowing off Brazil. But the good news is that a strong front is due to leave Cape Frio (off Rio de Janeiro) on Tuesday. The next goal is the tip of South Africa: Francis Joyon and his crew crossed the longitude of the Cape Aiguilles after 12d 21h 22′ at sea. So, with a 23 hour advantage on this first stretch, Yann Guichard and his crew can hope to stay half a day ahead before entering the Indian Ocean. This same trimaran, when it was Banque Populaire in 2012, took less than twelve days from Ushant (11d 23h 50′).